Members of Mountcollyer and Holy Family youth clubs launching their DVD and report following their fact finding mission to Berlin to examine projects that have developed following the Berlin wall coming down. 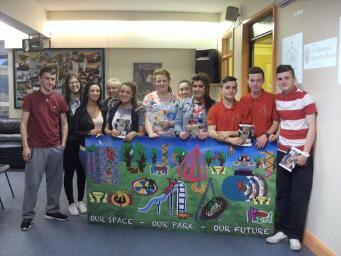 Well done to all young people from both communities for their excellent leadership and presentation. latest! OPERATION TORUS - DRUG DEALERS BEWARE! LATEST - ALEXANDRA PARK - DISPELLING THE MYTHS!. . . . . . . . . . . . . . . . . . . . . . . . click here! to SEE THE REAL SUCCESSES! ......WASHINGTON.....BOSTON......NEW YORK......MELBOURNE......VICTORIA......VANCOUVER......DISTRICT OF COLUMBIA.....WHITE ROCK......HALIFAX......AUCKLAND......MALAGA......BARCELONA......NEPAL......CARDIFF......SWANSEA......GLASGOW.....EDINBURGH......Dundee......Lerwick......Coventry......Leicester......Sheffield.....Ayesfield......LONDON......BIRMINGHAM.....BLACKBURN.....BRISTOL......LEEDS.....MANCHESTER.....LIVERPOOL.....BLACKPOOL......LUTON.....DUBLIN......Galway.....Waterford......Letterkenny......and CORK......please remember to leave feedback!! Welcome to the website of Tigers Bay & Mountcollyer Policing and Community Safety Partnership! This is a "community led" website supporting the Police, Northern Ireland Housing Executive, Belfast City Council and other relevant statutory and voluntary sector agencies to work together in multi-agency approaches, to deal with crime, anti-social behaviour and illegal drug activities in the Tigers Bay and Mountcollyer areas. 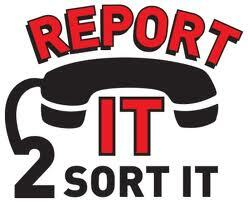 This site and the associated Tigers Bay & Mountcollyer Policing & Community Safety Partnership rely on the support of the local community to report crime, anti-social behaviour and illegal drug activities directly to police who in turn investigate and deal with those involved in such activities. The partnership helps by monitoring the performance of police and where appropriate, other relevant statutory agencies, to ensure every effort is taken to maximise the impact of policing and community safety work in the Tigers Bay and Mountcollyer area. 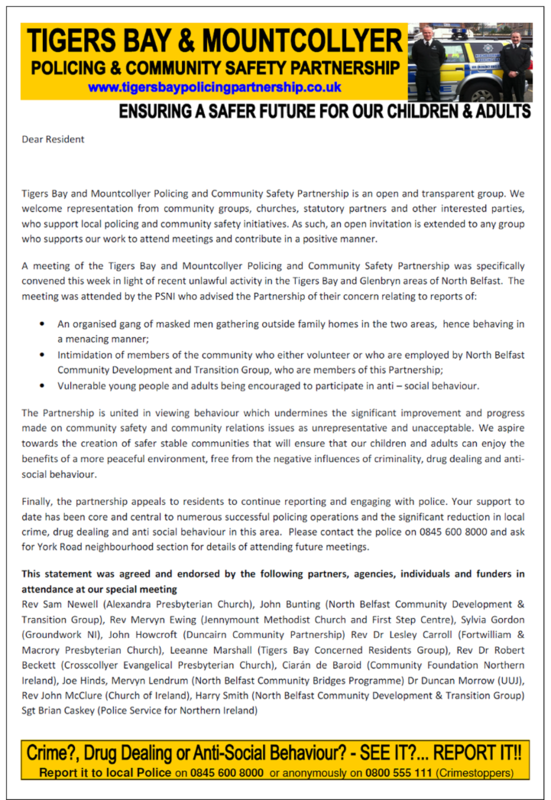 Please see below letter to residents from the Tigers Bay and Mountcollyer Policing & Community Safety Partnership. Crime maps and statistics. Click on an area below! 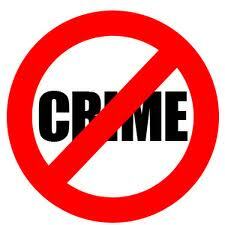 Crime and Interface Violence Significantly Reduced! Since the Tigers Bay & Mountcollyer policing and community safety partnership was established four years ago, there has been a significant drop in local crime in the Tigers Bay & Mountcollyer communities. We have also witnessed a significant reduction in sectarian related interface violence. Statistics have never been lower thanks to the silent majority of residents who now co-operate with police. 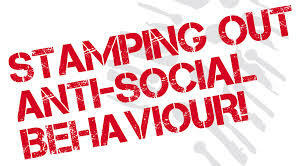 Tigers Bay and Mountcollyer residents now report crime, anti-social behaviour illegal drug activity and suspicious activity directly to local police at York Road police station or anonymously through the charity Crimestoppers. 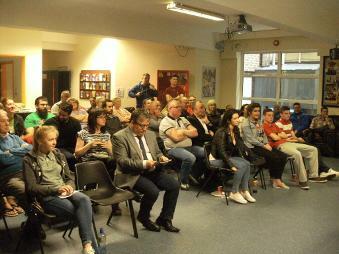 "Residents of the Tigers Bay & Mountcollyer communities are to applauded for taking the time and having the courage to take positive action by reporting crime and suspicious activity directly to Police or anonymously to Crimestoppers"
North Belfast Community Development & Transition Group, Tigers Bay Concerned Residents Group, North Belfast Community Bridges Programme, Church of Ireland, Crosscollyer Church, Jennymount Church, Fortwilliam & McCrory Church and local Councillors all working together to reduce crime, anti-social behaviour and illegal drug activity in an accountable partnership with Police and other statutory agencies. Sergeant Brian Caskey and the York Road neighbourhood team are at the core of community development and community relations work in the Duncairn area. Working in partnership with the community sector, the neighbourhood team have built relationships and confidence to such an extent that they are now accepted as lead partners in numerous community projects and programmes both on a single identity and cross community basis. North Belfast NIHE District Manager Malachy McKinney isn't afraid to roll his sleeves up and get personally involved with the work of Tigers Bay and Mountcollyer Policing & Community Safety Partnership. 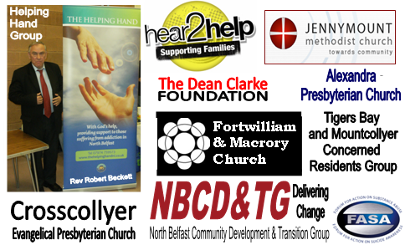 Malachy has supported the work of our partnership since its inception. He is keen to ensure his officers also play a hands on role in supporting the partnership whether it be through multi-agency approaches or community led projects. Belfast City Council Anti-Social Behaviour officer Mark Corbett, brings a varied range of Belfast City Council services, resources and experience to the partnership table. Mark is an active participant and always on hand for advice and help. He is committed to empowering and supporting communities to work in partnership and hold police and other agencies, including the Council, to account, in terms of dealing with community safety problems.